Gallery Oldham is set to launch a new exhibition, ‘William Stott of Oldham: Great Painters Are Rare’ on Saturday 26 January 2019. 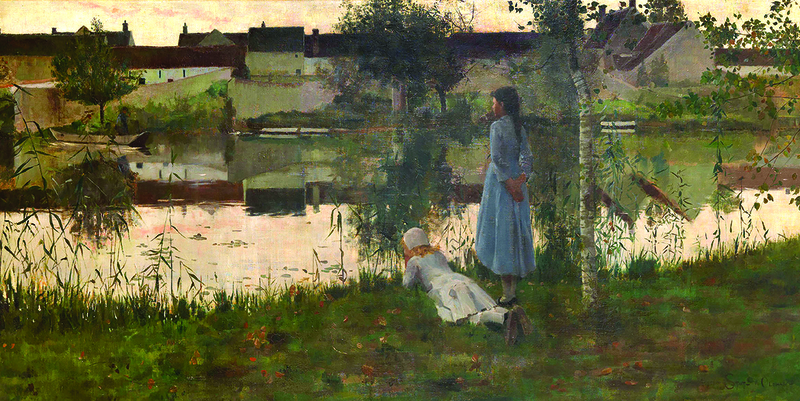 The exhibition will explore the work of the world famous Oldham-born artist William Stott. His most celebrated painting, Le Passeur, will be the centre piece of the exhibition and the full installation will explore William’s most celebrated works and his legacy. It will also include loans from Tate, Touchstones Rochdale, Manchester Art Gallery and Aberdeen Art Gallery, as well as key works from Gallery Oldham’s own collection. Some of the pieces will be by Stott himself and others will be by those who worked with the La Passeur creator, and of course, those who came after. For most of his career, Stott painted landscapes, but he went in a different direction during the late 1880s and began to move towards pictures involving classical figures and allegorical themes, such as ‘Hide and Seek in the Garden of Epicurus’ and ‘The Birth of Venus’. He mainly worked in oils, watercolours and pastels – media appropriate to his atmospheric style. Le Passeur (The Ferryman) by William Stott of Oldham (1857 - 1900) was secured for the British public with funds provided by the Heritage Lottery Fund, Art Fund (with a contribution from The Wolfson Foundation) and The Hintze Family Charitable Foundation. Gallery Oldham is the third partner gallery to display Le Passeur as part of a UK wide tour in partnership with Tate, thanks to funding from National Lottery players through the Heritage Lottery Fund, the John Ellerman Foundation and Art Fund. Since 2017 the painting has been on display at Tate Britain, Oriel y Parc Gallery and Visitor Centre, Southampton City Art Gallery and will be exhibited at Aberdeen Art Gallery in late 2019. At each venue the painting features in context-rich display, complemented by learning resources and a programme of training for staff and volunteers. Paul Jacques, Cabinet Member for Education and Culture, said: “It’s an honour that such a prominent member of the art community was born and raised in Oldham. “These paintings are part of a national collection and they’re famous for a reason. “Usually you’d have to go to the large galleries in London or Scotland to see work of this calibre so it’s fantastic that it will be here on people’s doorsteps in Oldham to view for free. “William Stott’s legacy still lives on in our town and I’m sure his artwork has inspired many younger artists of this generation.